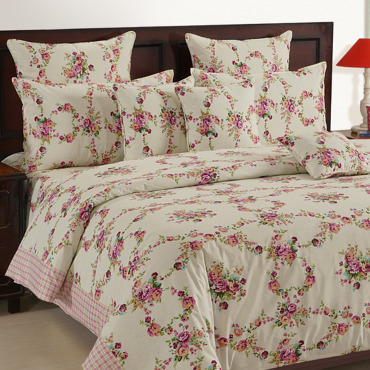 Spread a Lovely Layer of Affection and Elegance Now, it’s been easy for you beautify your home with lovely touch through gorgeous blooms printed on bed in a bag set. You may choose products of this bed in a bag set as per you choice and requirements, but we would suggest you go for set as you may easily create a balanced harmony of bed room interior. Ignite The Fragrant Vibes of Lavender Blooms Brighten up even the dusk with lavender allure! Spread the fragrance of chilling mint through these printed bed in a bag set included double bed sheet, pillow covers, and comforters etc. We bring you an amazing opportunity in a new face of these lavender blooms to make your morning more natural. Nothing can be better day if it starts with bloomy ambiance and we understand the importance of perfect morning for perfect day therefore introduce blue orchid bed in a bag collection comprised of double bed sheet, pillow covers, and comforters etc. Get Magnetized in The Magical Vibes of Mystic Roses We bring you one of engaging colored bed in a bag sets, which lets the viewers to get magnetized with its dark pine green colored flowers. In the embracing lap of these alluring flowers, user may feel like heaven. 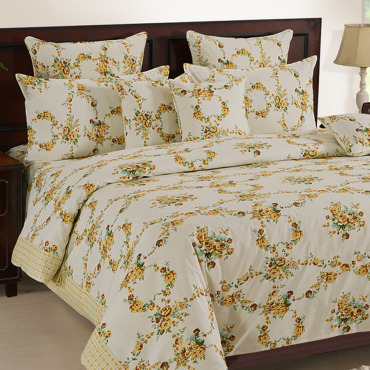 Have A Beautiful Dream Journey In The Valley Of Flowers We adorn a beautiful garland of valley flower on you bedding through our bed in a bag collection. The print of valley flowers is printed in peach color for creating soothing vibes in the space for complete relax and calmness while having rest and sleep. Get Loved by Various Affectionate Garlands Adorned on Your Bedding Various bunches of tiny flowers in form of tiny garland are imprinted over this set through pastel pink. The whole bed in a bag is themed with same print and you have such bright opportunity to choose what you feel good for your space. Transform Your Room with Modern Design Fall in love with green streaks sparkle bed sheets. Stripes are a fun addition that can add visual interest and depth to design. These bed sheets are designed with extreme precision to give your home a distinct appearance. Buy green streaks veda bed sheets from the online portal of swayamindia.com and modernize your décor. Urban chic stripes for contemporary look Bring home the beautiful assembly of striped bed linen set to make your room look spacious as stripes help you present a wider look to your bed. Layers of colorful stripes create a lively and cheerful ambience in your space. Start Your Day With Urban Pattered Imprinted With Majestic Blue Bedding A chilling sensation is what comes to you once you this majestic blue imprinted through urban pattern. The combination fulfills the requirements of modern bedroom with its refreshing vibes and modern essence. What else a home maker wants while waking up in the morning. Keeping ornamental design in pink color has given us phenomenon beauty and we bring it for our dear customers imprinted on pure premium cotton woven through high TC, 150. The entire combination is not less than any luxury and hence we also call it our one of theluxury bedding sets. Your dream to form your bedroom with ultra-urban environment comes true with us! We take you a step ahead through this design and bring you a pattern which is exceptional and you would not get it anywhere in the market. The sharp edges design pattern depicts the sign of gigantic urban building structure. Imprinting different shades of spheres spreads an exceptional charm all over the bedding and somewhere it would engage you with the magic of its various spheres. 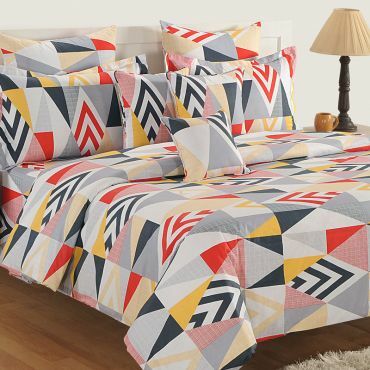 It would also complement your modern interior since it is counted among modern bedding designs. It may also be playful with its appealing look which insists you to see it again and again. Make the dive fun double when you find out elegant ornament in the journey! We give you a way to start your morning with full of energy along with beautiful scenario around your through this ornamental ocean. We always focus to create unique designs which are never seen before. It’s great idea to form a perfect harmony with balanced thematic interior through bed in a bag collection since we have designed all the bedding set in same design. Now, you may decide your bedding set up as you wish. Wake Up with Green Imprinted on Regal Ornamentals What a combination we bring you! It’s an amalgamation of green environment and royal touch. Regal Green Veda collection is emerged from the blend of these two elements. Imprinting dominating green on ornamental soothes not only your eyes with its green color but also your heart with ornamental design. Enjoy the Blend of Modern Art and Traditional Design We got an idea to mix modern art and traditional design in such way that it births something engaging. Here, we come to present that creation which swayam promises would not get anywhere in the market. Adorning the red layers, a sign of modern art, on the ornamental designs, a sign of traditional legacy, must be a good piece for your pick up. 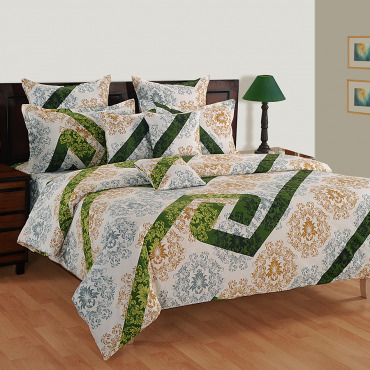 Serene Vines Add a serene charm to your room with a beautiful golden vine designer bed linen. 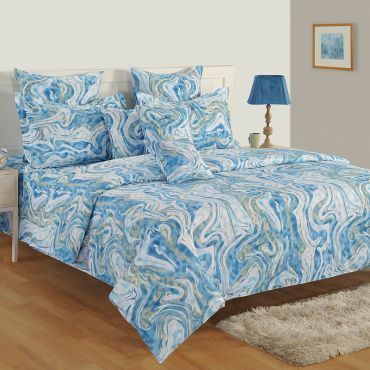 The free flow of vines all over the luxury bed linen presents a refreshing look to your room. The gold shade and the bright floral prints help you add a classic vibe. Buy Golden Vines Veda bed sheets exclusively at Swayamindia.com and create a perfect place to relax. Have A Hug With Heartfelt Garland World Let’s welcome you in the world of heartfelt garlands where not only your but also your mind and soul will be loved and healed in its fragrant vibes. 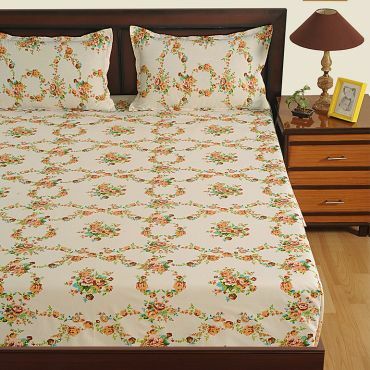 We introduce floral garland themed based bed in a bag set included double bed sheet, cushion covers, and comforters etc. Be Blessed with Nature’s Love A fusion of soothing pastel green and blue is imprinted on the bed in a bag amazingly. The unique and mesmerizing allure of the soft shades of the color engage the users towards it. It connects to the users easily and creates inviting vibes for the rest. It is not less than any lap calling for sound sleep and when user wakes up; it rejuvenates with its nature theme. 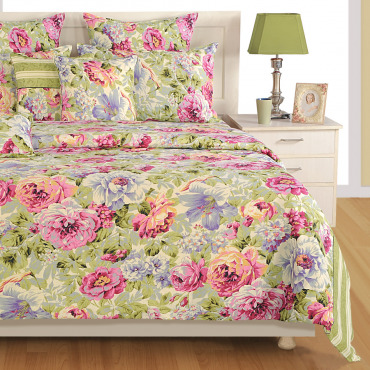 Embellish your double bed with a rich floral luxury bed linen set. The beautiful artistic floral in pleasant pink, blue and green combination helps you create a vintage royal look to your room attire. Well, it’s not over, the striking contrast stripes on hemline also help you give a blossoming transformation to your room. The coordinated stripes on cushions and pillows add to the drama. 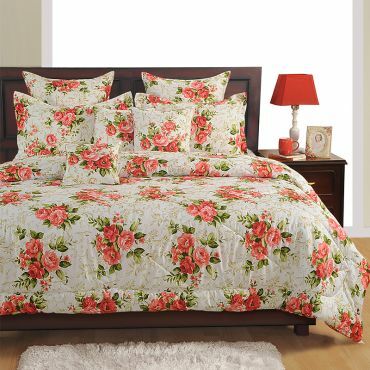 Surrender yourself in the confines of beautiful gold and pink colored floral printed luxury bed linen. 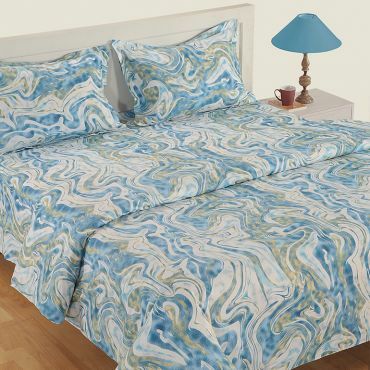 The lively prints would certainly add a vivacious look to your bed and strike the perfect chords of comfort and style. 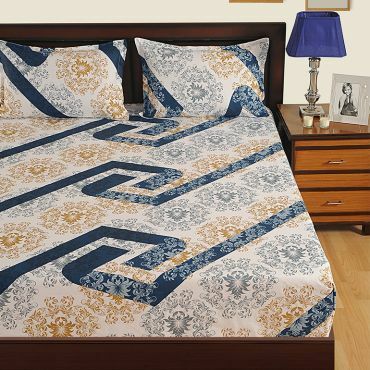 As the prints are spread on all quarters of the luxury bed sheet, it creates an enthralling vibe to your personal space. Get Landed in the World of Love Through Magnetized Red Spread a layer of lovely red on the bedding with the floral theme and see the magic of magnetizing elegance. The admirable red and lovely blooms are imprinted on entire bed in a bag. The advantages of this bedding become double when the incorporation of pure cotton takes place in its built. 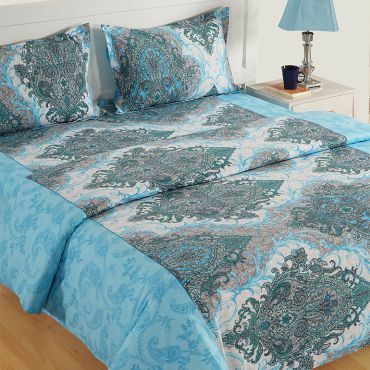 The mesmerizing allure of the eye-catching turquoise is landed into your bedroom through lovely bed in a beg set. The blooms poured into such lively color would soothe not only your eyes but also your mind. Have an Urban Touch with Gracious Checks A layer of sophisticated grey check is awaiting you to adorn your bedding graciously with urban appearance. We use modern home fashion pattern this time in Veda collection. A bed in a bag set of same print is available for forming balanced thematic harmony in the bedroom. Feel the Comfort in Lovely Bed Sheet Create a romantic ambience in your room by draping your beds with cherry blossom veda bed sheets. These luxury bed sheets will grace your bedroom with eternal love as they are beautifully designed with magical floral patterns. Buy cherry blossom veda bed sheets from the online portal of swayamindia.com and give your home a refreshing look. 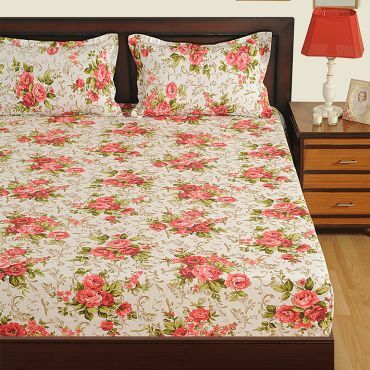 Imbibe a dose of freshness to your personal space with floral printed bed linen. The soft and beautiful indigo rose and a splash of icy blue leaves give a fascinating appearance. Printed rose on white background reflect liveliness and add a fresh look to your room. Blue and white make for a deadly combination. 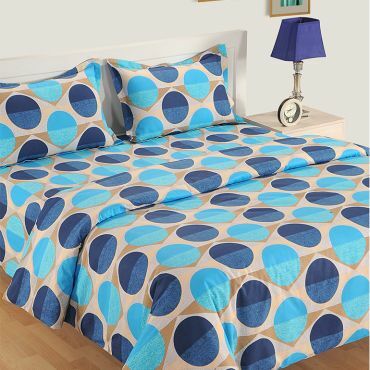 Get home this beautiful set of luxury bed linen exclusively from www.swayamindia.com. Surrender Your Mind, Body & Soul in The Embrace of Bloomy Lap Undoubtedly, with thinking twice, we would highlight its top of all character which is none of other than its color combination. The way of choosing color is sophisticated to heal the wounds of mind within only glimpse of such soothing print imprinted on whole bed in a bag set. 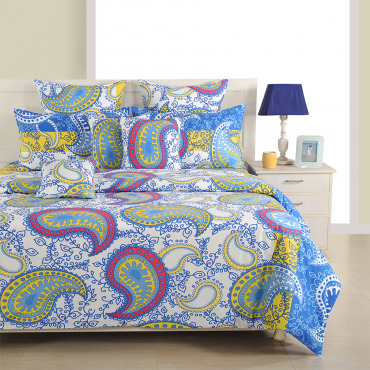 Fill the colors of happiness in the living easily through this vibrant paisley bed in a beg set included double bed sheet, pillow covers and comforters etc. 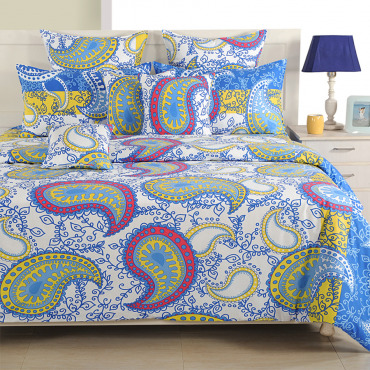 it’s a great opportunity to adorn bedding with vivacious paisley; it is just unique to others since the traditional ornamental paisley is imprinted with different shades of vibrant colors. Present a sophisticated look to your room by including a gold paisley luxury bed linen to your personal space. 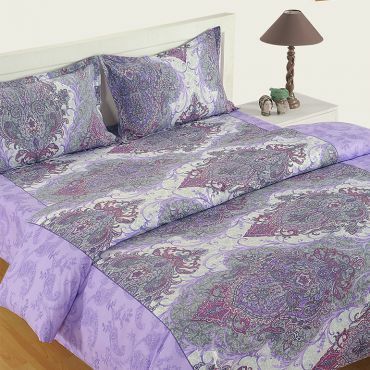 The soft paisley prints are incarnated on attractive check patterns which add an elegant look to your room interiors. The colours help you create a contrasting flair. Buy Woven Gold Veda bed sheet exclusively at Swayam to create a harmonized vigour to your personal space. Let’s Hug the Traditional Cuteness on Your Dream Journey Kick off your days with energetic morning attained through restful and sound sleep in the embrace of lovely traditional paisley. 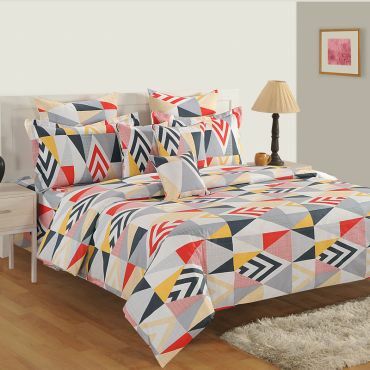 We have imprinted of entire products of this bed in a bag with same print to make a uniform bedding embellishment in the bedroom which would balance overall interior theme. Swayam is always known for creating its own creations having an Indian essence and international touch in all its products. The collection is also designed keeping the same values and core on priority; the name Veda itself must express its cultural origin and flavor. Choosing Sanskrit name right for this collection justifies the meaning of name Swayam, a pure India brand, undoubtedly. Bed in a Bag: What It Brings to You! We introduce an appropriate bedroom bedding sets for those who want to own home fashion products based on Indian aesthetics and modern look. Majorly, the larger segment of this collection is imprinted with various and different kind of flowers and natural elements. The colors used are quality filtered and please eyes with its soothing and vibrant vibes both. The amalgamation prepared with eye-catching blooms and vivacious colors is especially designed to spread the fragrance of elegance, style, and fashion in the living space. This set is available in bed in a bag collection. We have infused an advanced technology of high thread counts to transform ordinary space into a regal palace. We make it easy for you to celebrate your any occasion or function magnificently in grand way. It’s a golden opportunity to festival and party lovers to keep the environment of the living room inviting and cheering all the time. Now, you may impress your guest with its glossy look and smooth texture which would not fade away even after longer run. 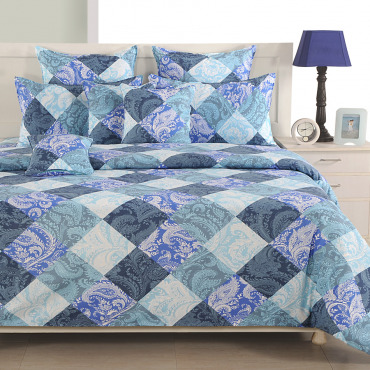 Royal in look yet durable in use with such luxury bedding set! We use premium cotton fabric to manufacture this cotton. The usage of pure cotton turns your living space hygienic and healthy with its unbeaten properties. Apart from comfort, this cotton bedding set maintains hygiene around bedding by absorbing excess sweat and prevents the space from any odor and germs.